In The Observer, Hugh McIlvanney wrote afterwards that it was “not so much a football match as an international incident". To understand its significance, you had to go back two years, to the Taça das Nações (Nations Cup), which had been held to mark the 50th anniversary of the Brazilian Football Confederation. It featured the hosts, England and Portugal, but was won by Argentina, who didn’t concede a goal in their three matches. Antonio Rattín, the tall and elegant captain, was the heartbeat of that fine Argentine side, and the quarter-final at Wembley in June 1966 promised to be the toughest test of England’s credentials. Sure enough, after Bobby Charlton had struck the post early, it was Rattín and Argentina that took control, much to the dismay of a fidgety crowd. Then, the red fog descended. First, Rattín let his foot stall Charlton’s progress, and then he brought down Geoff Hurst. The fouls, on their own, were not that sinister, but he followed up with a barrage of invective aimed at the referee. Rudolf Kreitlein may not have understood Spanish, but he sensed the tone. Later, he would say that he sent off Rattín for “the look on his face". Just 35 minutes had elapsed. Rattín trudged off slowly and disbelievingly, then tried to come back on, before making his way to the tunnel. Abuse and half-eaten chocolate bars rained down from the stands, and, despite his teammates coping admirably with 10 men, a Hurst goal 12 minutes from time was enough for England to go through. Sir Alf Ramsey, their manager, would call the Argentines “animals", and there’s more than a little irony in the fact that the Argentines were guilty of only 19 fouls, to England’s 33. 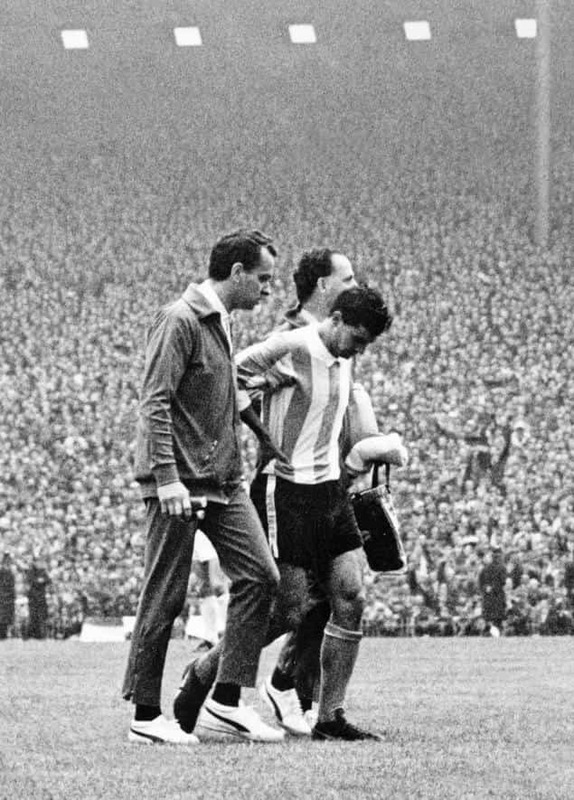 Half a century after he was given his marching orders, Rattín told the Argentine daily La Nación: “I saw that all his decisions favoured England...corners, fouls, he even invented handballs. In view of that, I showed him my captain’s armband and for several minutes asked for an interpreter to ask for explanations." Even the English had a measure of sympathy for one of the game’s standout players. Brian Glanville, writing in The Sunday Times, described Kreitlein as “a small man, strutting portentously about the field, bald, brown head gleaming in the sunshine, (as he) put name after Argentinian name into his notebook. One was reminded of a schoolboy collecting railway engine numbers." Very few sportspersons have dominated a global event to such an extent that it became synonymous with them. There was Mark Spitz and his seven golds in Munich (1972), and, in recent years, we can think of Usain Bolt and the Beijing Olympics (2008). But, above all, there is Diego Maradona and the magical month in Mexico (1986), when he raised his game to a plane few others have ever come close to. Consider the numbers. Of the 14 goals Argentina scored on their way to the title, Maradona accounted for five. He set up five of the others, including the superb pass for Jorge Burruchaga’s winning goal in the final. He played as though immune to the effects of gravity, completing 90 dribbles, and drawing 53 fouls. The deft finish against Italy in the group phase, the two magnificent goals in the semi-final against Belgium—one with the outside of his boot, the other from the instep—and the virtuoso display against England, handball and all. What is there to say of the second goal, when he did a Scarlet Pimpernel through the heart of England’s midfield and defence? “Maradona on the ball now," said the legendary Victor Hugo Morales on commentary, his voice still calm. “Two closing him down. Maradona rolls his foot over the ball and breaks away down the right, the genius of world football. He goes past a third, looks for Burruchaga. Maradona forever! Genius! Genius! Genius! He’s still going... Gooooal! Sorry, I want to cry! Good God! Long live football! What a goal! A memorable run from Maradona. The greatest solo goal of all time. Cosmic Kite, which planet did you come from?" More than 30 years after that other-worldly piece of skill, we’re still searching for an answer. This was the match that had everything—two penalties, a wonder goal, a marvellously inventive free kick, a red card, a disallowed goal, and a shoot-out to cap it all. And right through it, thousands of Argentine fans, some still nursing grievances from the Falklands War a generation earlier, bounced up and down while chanting: “If your mother’s not an English whore, jump in the air." Gabriel Batistuta’s sixth-minute penalty put Argentina ahead, only for Michael Owen to win one of his own 3 minutes later. Contact in the box was minimal as Owen tumbled over, but Alan Shearer dispatched the spot-kick with no fuss. Eight minutes later, Owen scored one of the all-time-great goals. 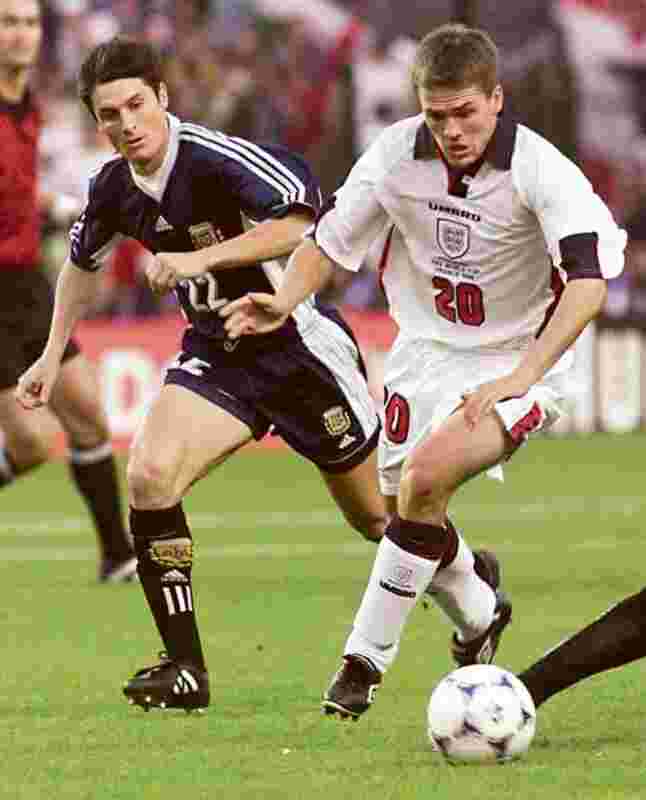 Receiving the ball from David Beckham just inside the Argentine half, he first ran to the left before cutting to the right and ghosting past two defenders. With Roberto Ayala trailing in his slipstream, Owen lifted the ball past Carlos Roa in goal. Argentina’s response, on the stroke of half-time, was as delightful. With the England wall and David Seaman in goal expecting Batistuta to batter in a free kick, Juan Sebastian Veron deftly laid it off to Javier Zanetti, who took a touch and lashed in. Early in the second half, Beckham kicked out at Diego Simeone, with the referee less than five yards away. But after the red card, it was England that nearly won it, with Sol Campbell’s header from a Darren Anderton corner chalked off for baffling reasons. Hernán Crespo and Paul Ince both missed their penalties, and when Ayala—run ragged by Owen earlier—placed his neatly to Seaman’s left, it left David Batty needing to score to keep England in the competition. He struck it straight at Roa, and Daniel Passarella—the manager who had controversially excluded Real Madrid’s Fernando Redondo because he wouldn’t cut his hair—celebrated so fervently that he tumbled to the turf.